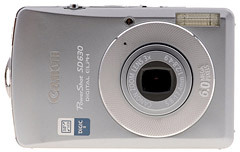 The Canon PowerShot SD630 has all the bells and whistles that you'd expect from a quality 6-megapixel compact, and more... more ISO speed. Most compacts have a hard time controlling image noise above ISO 200. This is one of the compelling reasons to use a DSLR -- you can shoot at ISO 800 and 1600 and get quality images. "To me, digital noise has always resembled that obnoxious snowy fuzz you get on your TV when it's stuck between channels. The triumph of Canon's recent digital SLRs is that they've been able to shoot at high ISOs with low incidence of noise. With these new ELPHs it appears Canon has been able to bring its low-noise/high ISO expertise to a non-professional audience which is very good news for consumers. Most people have gotten so used to shooting with a flash in low light that they're amazed when they see the results without one. Instead of blown-out faces and blacked out backgrounds you have nice natural skin tones and detail of the room behind your subject. While there's still a greater chance of blur when you shoot without a flash -- even at the SD630's speedy ISO 800 setting -- if your subject's relatively still, results with the Canon SD630 look sharp." There's lots of other good info in their review, and I think it's worth a read if you're shopping for a quality compact in the $300 range that can shoot in existing light with good results. You can also check out Canon's product page. I have a 630... been using it for recent trips including a couple of GeekCruises. Been very happy with it... the only thing missing is the ability to zoom while in movie mode (still no way to do that!) and of course I miss my Tv and Av settings. And yes, now that you mention it, the high ISO pictures have been coming out much better than the SD400 I had previously. See you on the upcoming Photo cruise!